The Toblerone triangle is probably the closest and most successful symbiosis ever between a product and its packaging. Theodor Tobler and his cousin Emil Baumann created the shape with the invention of filled chocolate in 1908. The famous carton packaging was part and parcel from day one. The result is a unique icon. The meteoric success of Toblerone started in 1908 when Emil Baumann, Theodor Tobler’s cousin and production manager in the company, discovered a special nougat product during a business trip through Alsace. As the legend goes, the very same evening after his return, the two cousins worked together over pots in Theodor Tobler’s kitchen and attempted to combine milk chocolate and the white honey-almond mixture. Today, Toblerone counts customers in 120 countries: More than 90 per cent of Toblerone production are exported. Based on interviews with experts, the “Time” magazine voted the Toblerone chocolate bar as being one of the most influential chocolate bars of all times. This now-iconic triangular carton prism wrapped the first chocolate bar to debut with a filling. Meanwhile the company is part of the international foods group Mondelēz International. However, every Toblerone bar consumed across the world still originates from the only Toblerone factory in the world, in Bern-Brünnen. The communication approach to consumers has changed in line with the communication channels – and today, digital channels play an increasingly prominent role. Consumers and other stakeholders today look for a dialogue with the brand or the company behind the brand. One problem of brands on the Internet has already been solved: the silhouette of the carton packaging lends Toblerone an unmistakeable look. “Consumers are informed and interested and share their opinions – both positive and negative – openly. They become brand ambassadors through viral dissemination of campaigns that appeal to them. On the other hand, criticism of companies or brands is disseminated just as quickly. Transparent processes and responsibilities help to manage this channel up-to-date, correctly and competently”, states Daniel Meyer of Mondelēz Switzerland. The highest environmental standards are complied with, from the raw material, through production to packaging. For example, over the last 11 years, energy consumption has been reduced by 52 per cent and water consumption by 76 per cent. The brand also benefits from comprehensive, global sustainability programmes like “Cocoa Life”. The original Toblerone has lost none of its lustre despite the many new tastes. The large Toblerone Gold with a weight of 400 grammes is the absolute number one among candy in the duty-free segment. Since the 1990s, the name, the packaging and the triangular shape of the packaging and the shape of the chocolate have been trademark protected worldwide in numerous countries. 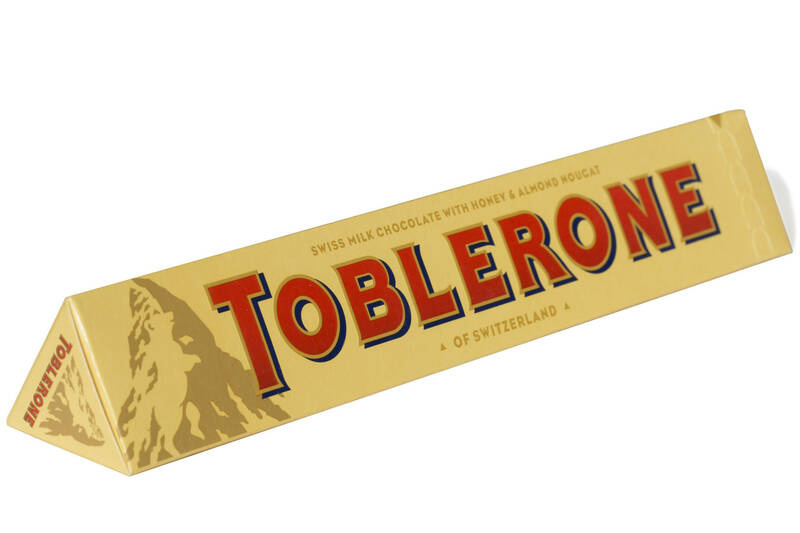 The characteristic carton packaging was carefully redesigned in 2000: the blue-white Tobler logo has disappeared and been replaced by the Matterhorn on the packaging. But the characteristic shape remains unchanged, it is an integral part of the brand’s core. The triangular shape remains the most prominent element in brand communication. 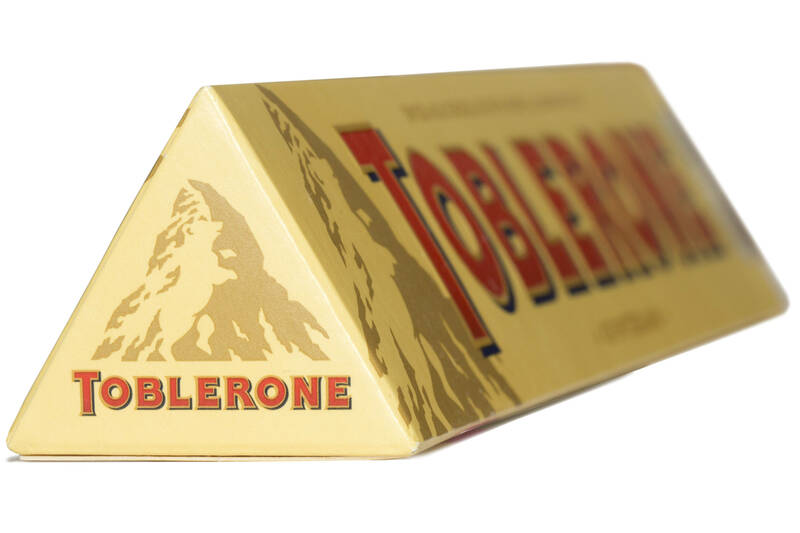 Even without the logo, or in different colours, the distinguished cartonboard packaging is immediately recognised as Toblerone. The carton is – and remains – the calling card of the product: sustainable, protective, adding value, promoting sales and “honest”.